In Ancient Rome a festival and purification ritual was held on February 15th – Februa – which was the Full Moon in the old Lunar Roman calendar. This festival day – “dies februatus” – day of purification, was considered a rite of Spring that heralded Nature’s fertile seeds stirring and preparing to bloom. This reminds me of my Valentine’s Day post from last year, “Green is the New Pink – Spreading the Emerald Glow of Love Today and Always“, which you may enjoy reading again, or for the first time if you didn’t last year. Avia Venefica always has some very insightful and interesting information on symbolism that she shares and some of nature’s symbolism for February she discusses, help you to understand this “purifying” energy that is fertile in this month. This includes the Ancient Celtic sacred system of tree knowledge, which is the Ogham. This month’s sacred trees are the Rowan and Ash, which perfectly embody February’s energy. The Rowan helps with discernment (a key theme lately) that helps us clarify the paths we are taking, as well as assists in transitioning (just like the Ash does), while protecting, and leading us to find balance. And the Ash sparks and ignites new hope and inspiration that will support rebirth and renewal for expansive creation. We also have February’s symbolic flowers – Violet and Primrose that mirror much the same. Violets herald hope and that inspirational trust when their petals emerge in the snow. Primroses initiate energy into action with courage to forge ahead even in the midst of bleak and challenging conditions, and also remind of the continuous renewing cycles, while staying devoted to our hearts. Primrose is also connected to the Faery realms and Ancient Celtic wisdom shares that where a patch of Primroses are, a gateway/portal exists to journey there. And for us, today, Valentine’s Day February 14th, happens to share our splendid Full Moon in Leo, which adds a dramatically energetic and invigorating charge to the processes of purification we are moving through this month. There’s no hiding out from things now indeed! Not only do things want to come to the surface and be “seen”, but this can sometimes involve some surprising shocks and twists, especially when Aquarius is involved, which the Sun and Mercury are in. Yet these ultimately are leading you to your authenticity, which results in direct connection to the collective/humanity’s highest good. We’re in an innovative and shattering phase with Aquarius in Mercury, but with the retrograde until the 20th of March, this can come in ways that will help us rise to the occasion. Let’s not see this as a problematic time, but rather an opportune time to exercise your gifts and harness energy in a new and empowering way that can provide expansive growth. Truths are to be revealed, both to yourself and to others. Veils lifted. Fears faced. And courage is derived from vulnerability. So hang on to your hats, and remember the things you’ve asked for, as this will help you to understand the experiences that come up aren’t as surprising as they seem, but simply mirroring the highest good in reflection to what you desire. We can avoid creating a lot of drama if we realize what is really at work. This is definitely a creative, expressive, and supercharged time for opening that heart wide and letting it flow in ways you haven’t before. Maybe that means an emotional release that will relieve and renew. Maybe that means an expansion that will stretch your heart to realms unexplored yet. In what ever way it flows, it will bring you more closely and intimately in alignment with your unique authenticity. It’s the perfect time, if you haven’t already, to recognize the most divine relationship you’ll ever have is the one with yourself and that all else is a reflection of the type of dance you choose to partner in, each time you hit the dance floor of experience in the embodiment of your personal frequency aglow. If there’s something feeling off, unfulfilled, or missing, take the time to tune into yourself today and over this month, to ask and truly listen to what that void space has to share. Chances are, your inner soul child is simply wanting to be heard. And being heard, actually entails you have taken to heart what he or she says, and make a new commitment to do at least one small thing each day to support the requests. These requests aren’t simply whims, but reflect a deeper knowing that will likely surpass your ability in the now to comprehend, but if you take the trustful steps to support them and do what it takes to integrate what could be of assistance to that process, the results will bless you beyond measure of any one thing you feel lacking and have been chasing after. A new kind of clarity and understanding is available to each of us. It will awaken and shift you the instant you recognize and embrace it. And it will always keep you in check so as to alert you of imbalances where you can then make different choices that will harmonize and return that balance that is so needed for everything to flourish. This will also help you to become more attuned to the natural world that will move you in divine cycles, rather than struggling against them to create artificial ones. Where are the barriers to your self love? Remove the veils and masks and be real about how you feel, not hiding behind what you think you “should” be feeling, saying, or showing to others. The time for being politically correct is a thing of the past. Never was this helpful and it definitely won’t be in this energetic landscape you want to play in fully. If you can’t be genuine with something – and you know when you’re not – then take time to explore what’s behind that. This is a Full Moon for opening up and expanding into more authentic love and compassion for self, others, and all of life. As we step into the lovely month of February, filled with rich symbolism and the energy of purification, I am reminded of my beloved Nestor who would have been celebrating her birthday today. 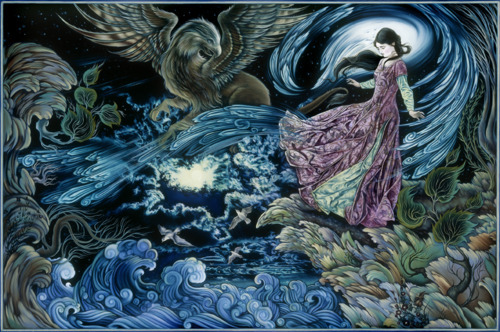 The symbols associated with this transitional month are very mirroring of the essence of our connection and of her soul – that of mysticism, magic, vision, rebirth, creation, inspiration, earth connectedness, ancient sacredness, renewal, love, devotion, faeries, healing and honor to name a few. I love this link from Avia Venefica’s awesome site I always refer to ~ Whats-Your-Sign.com: The Doorway to Signs and Symbolic Meanings ~ that shares great insights into the meaning and symbolism of February: http://www.whats-your-sign.com/february-meaning-and-symbolism.html. I don’t need the knowledge of this feast to remind me of my twin soul, as she is eternally with me and never far from heart and thought. But I do love symbolism, as many people know about me. And I love that we both share this month for our Birthdays – hers on the 1st and mine on the 26th and am excited that my art opening event falls on the 25th of this month as well, which Nestor will be part of in heart and spirit. 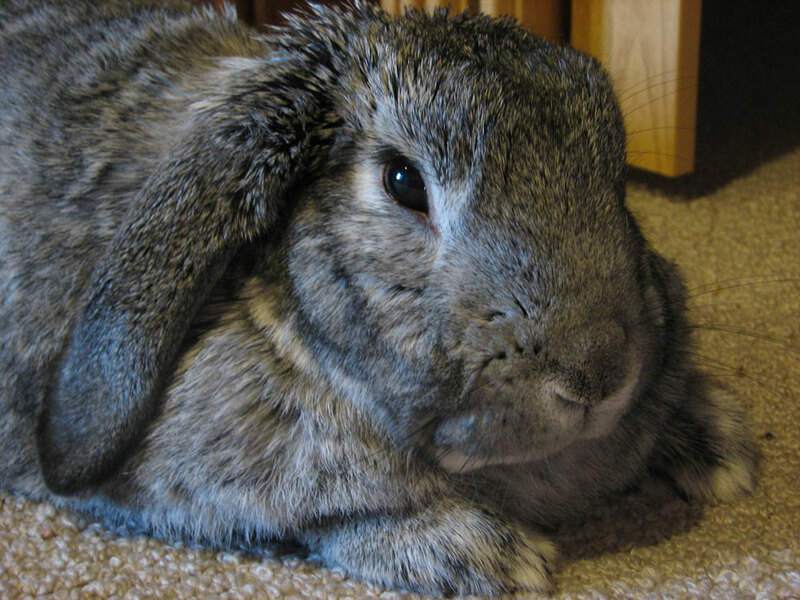 I am continually inspired and bathed in love by my beloved, precious being, Nestor, who has recently transitioned on April 27, 2008. She is the light of my life, even though she no longer shares this physical experience with me. I miss her greatly and yet I know she is with me in more expansive ways than ever before and continues to shower me with her magic and love from beyond. When you share a love that deep, there is no limitation as to what you can create. She continues to be a joy and an inspiration to me always and I honor her in every way. Through her, I have learned the meaning of unconditional love and this unwavering love for her grows stronger and more powerful every day. 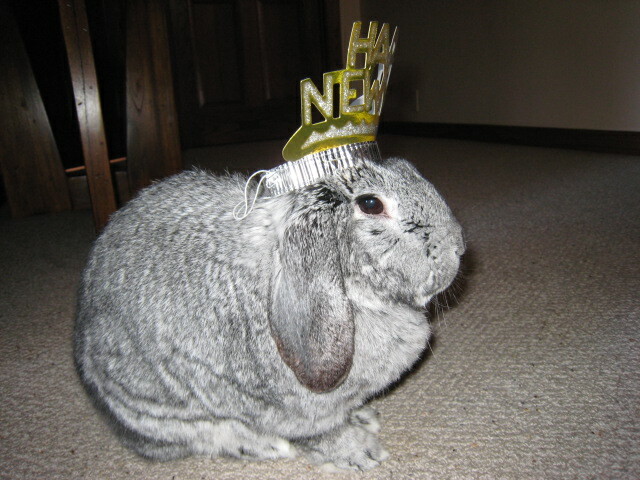 I never viewed Nestor as anything but an equal. She is sacred in every definition of the word and is now free to fly with the grace and power that is unimaginably huge and expansive. She constantly reminds me to stay in my heart and to remember the bigger picture of the path that I chose. 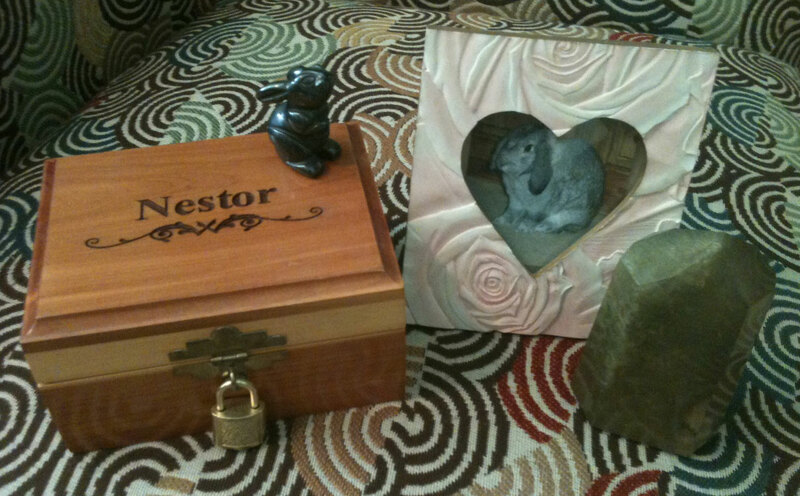 As a rabbit, Nestor embodied the collective soul of Earth’s sacred children. As a soul and magical being, she embodies pure unconditional love and compassion that I continue to strive to mirror. I honor her and cherish, with gratitude, all that she has to teach me, and others, by the simple beauty of her example. Throughout her physical experience, Nestor was a bridge for her species and an example to us all. As a Reiki Master Teacher and a profound healer, she assisted many animals and humans across the globe and continues to be of assistance in even bigger ways, without the limitations her body had on her hugely expansive and enigmatic soul. Thank you my beautiful, courageous Nestor. May your light shine for all to see. I celebrate you now and always. I LOVE YOU. Interestingly, I had been drawn to the Mayan Moon Goddess Ix Chel years ago not fully connecting the dots then and ended up getting a tattoo to represent her and my connection with Nestor, over my heart chakra on my back when I did come to realize why I had been so drawn to her. 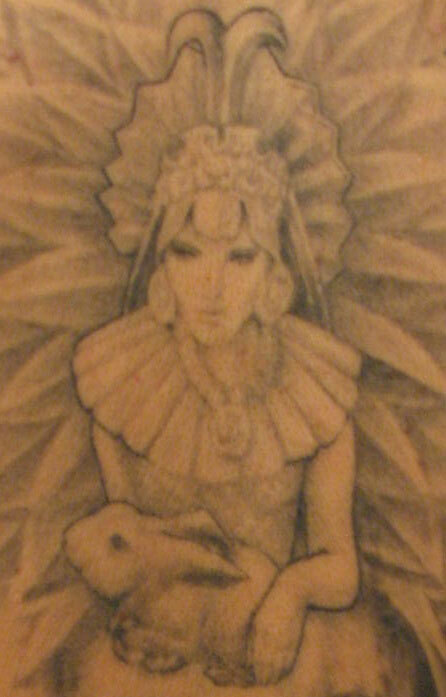 This was one of my first tattoos and interestingly the face on the goddess ended up looking like mine, which was not a conscious intention, but what ended up channeling from the tattoo artist who created it and the bunny, much like Nestor too. It’s one of my favorite tattoos. We have a strong connection with the Moon and Mayan symbolism and so it is always so cool when you connect the dots as to why. Here is the story about Ix Chel that holds symbolic meaning for us. 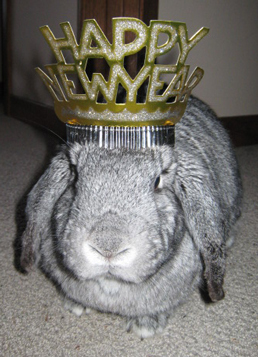 Ix Chel: The Mayan Moon Goddess or “Lady of the Rainbow.” The Mayans, like Buddhists, associated the moon with rabbits. 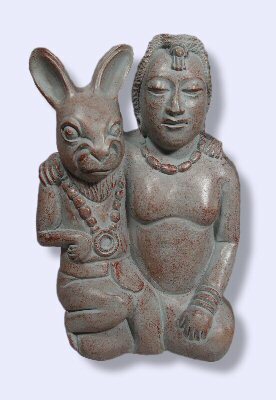 Ix Chel is a shape-shifter, consorting with the rabbit in spring, as the rabbit is considered the scribe of the moon calendar. She is often depicted holding a rabbit in her arms, a symbol of her life giving abundance and fertility, whose profile can be seen on the face of the moon. She is the Mayan Goddess of creativity (as inspiration for artists), magic, weaving, health, healing, sexuality, childbirth, and the energy of all water-our most essential life giving ingredient. The Mayan stepped pyramid is Ix Chel’s mountain where she reigns as the feathered serpent energy of transformation.